British Field Marshal Bernard Law Montgomery, commander of nearly a third of the Allied army, believed Eisen­hower was making a mis­take. British Prime Minister Winston Churchill was up­set that Eisen­hower was pre­pared to leave the capi­tal and epi­center of the Third Reich to the Soviets, and urged him to “shake hands” with the Soviets as far east as pos­sible. This fate­ful deci­sion was one of Eisen­hower’s most con­tro­ver­sial but it was in keeping with high-level agreements made months before. As early as January 1944, the Euro­pean Advi­sory Commis­sion (EAC), which was charged with allo­cating zones of occupa­tion to the three victo­ri­ous powers (U.S., Britain, and the Soviet Union), en­dorsed a plan along lines sug­gested by the British: Berlin would fall within the Soviet occu­pa­tion zone. In Septem­ber 1944, at the Second Que­bec (Canada) Con­ference, the heads of the two West­ern powers, President Franklin D. Roosevelt and Churchill, dis­cussed the plan. By the time FDR and Chur­chill were en route to the Big Three con­fer­ence at the Cri­mean resort of Yalta in the Soviet Union (Febru­ary 4–11, 1945), most of the details had been nailed down, including joint occupation of Berlin. Stalin accepted the EAC recommendations at Yalta, and the crea­tion of mili­tary zones of occu­pa­tion was announced at the close of the con­fer­ence. Eisen­hower, schooled in a tradi­tion that mili­tary com­manders should leave poli­tics to civil autho­rities, was not dis­tracted by the criti­cism of his stop order, and made for the Elbe River, meeting ele­ments of the Red Army at Torgau on April 25, 1945. 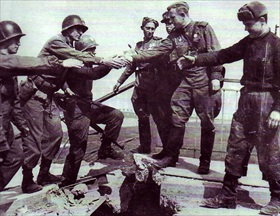 Left: This photo of GIs meeting Soviet soldiers on the Elbe is one of the two most famous photo­graphs of World War II; the other was the flag-raising on Iwo Jima in the Pacific. On April 26, 1945, after photo­graphing U.S. and Soviet generals and VIPs at the scene of the Torgau, Ger­many, his­toric link­up the day before, Inter­na­tional News war corres­pondent Allan Jack­son decided to take a picture of soldiers from the two sides shaking hands. He quickly gathered sight­seeing American and Soviet soldiers and posed them, taking several pic­tures that became well known and symbolic of the two great powers meeting at the Elbe River. A bronze bas-relief panel depicting the Torgau Hand­shake is on the right-side wall (toward the Atlantic Arch) at the World War II Memorial in Washington, D.C. 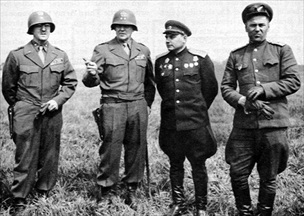 Right: Two U.S. officers from Gen. Courtney Hodges’ First U.S. Army and two Soviet officers from Maj. Gen. Vladimir Rusakov’s 58th Guards Rifle Division survey the scene at Torgau. The town on the east bank of the Elbe River lay 33 miles northeast of Leipzig. Left: Second Lt. William Robertson and Pfc. 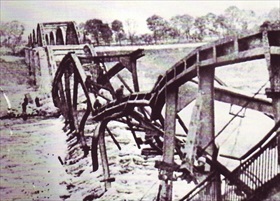 Frank Huff of the 69th Infantry Division crawl across the skeleton of the blasted bridge over the Elbe River (the two seen here in the “V” of the bridge) to Torgau on the east bank to meet Soviets Lt. Alex­ander Silvashko and Sgt. Nikolai Andrejew, 58th Guards Rifle Division, on April 25, 1945. 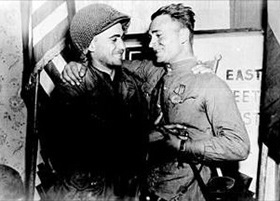 Right: Robertson and Silvashko pose on April 26, 1945, in front of a sign that reads East Meets West, sym­bol­izing the his­toric link­up of Soviet and American armies near Torgau. 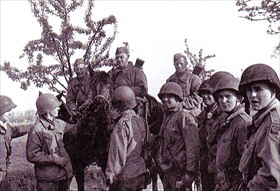 Left: Maj. Fred Craig’s patrol, one of three patrols of the 69th Infantry Division, meets a Soviet cavalry unit south of Torgau on April 25, 1945. 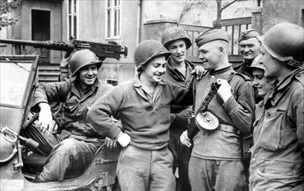 Right: A Soviet soldier holding a machine gun converses with GIs milling around a jeep in Torgau.